At this rate, more than 2 million people could visit my Pinterest page this year. Compare this to Twitter, where I obsessively tweet 20 times a day to get maybe a few retweets or this blog, which takes all year to reach 20,000 readers. What’s really strange is, I didn’t plan on becoming a Pinterest rock star. Pinterest is just a hobby, something I do for fun. But my Pinterest page has taken on a life of its own — pollinating pins throughout the Internet. The Pinterest statistics (available because I created a Business account) tell me that most of my viewers are women, West Coast American, Canadian and Aussies, and that they, no surprise, are interested in exactly the same things that I adore — bohemian fashion, DIY found object crafts, rustic gardens, sacred interiors, the outdoors, flea market finds, vintage trailers, hammocks in the trees, outdoor music festivals, healthy food. It’s a look and aesthetic that is distinctly me — and somehow citizens of Pinterest have decided I’m some sort of low rent Boho Martha and they like my style. 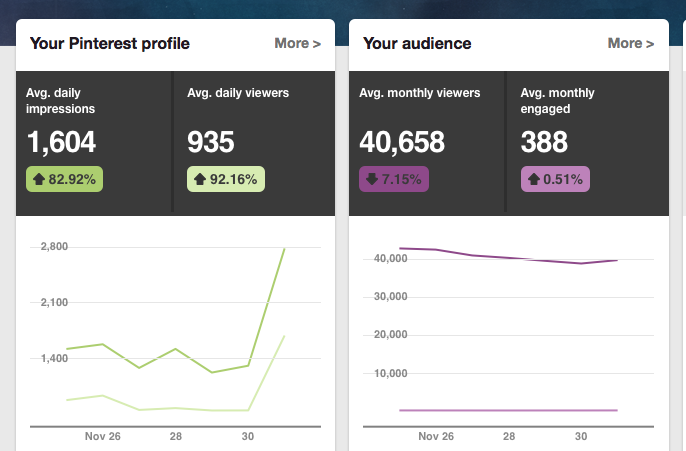 If my website got traffic like this, I’d be in the top 1% of websites in the USA. Pins get shared — and as they travel, your traffic grows. Pinterest does something that no other (free) marketing tool has ever done. It sends your “pin” like a little document, all over the planet — like a seed blowing in the wind. And everywhere it goes, this pin points back to your website. Where you are driving traffic to your webpage. Forever. Pinterest users’ average purchase value is 126% more than Facebook users. Pinterest is the 2nd largest driver of social media traffic after Facebook. That’s 43,000 views this month. Why? And how do I make money from this? Pinterest’s stats reveal some clues: the brands that my followers like, the products they buy. I have only 1700 followers on Pinterest, but those pinners can reach 2,000,000 people/year. But wait this is what is truly amazing, and what most people do not “get” about Pinterest yet — those people don’t even need to be on Pinterest. My pins could land on Twitter, in a blog, Facebook, Instagram, another website, an email — who knows. Pins, unlike Facebook, G+, Twitter or LinkedIn posts, are incredibly viral. Pinterest is even more viral than other forms of social media posting because they are not tied to Pinterest — each and every one of those “seeds” it sends out, in the form of a pin, will link back to your website — forever — no matter how often it is repinned or where it lands. While you can technically do this by sharing or embedding a Tweet or a YouTube video, it is just much more sharable and easier to do with Pinterest. ARE YOU GETTING THIS YET? This is like, you can reach as many people with a Pinterest page than the entire circulation of the Los Angeles Times. More people than a Superbowl ad on TV. Contact Giselle Bisson if you’re interested in learning how you can leverage Pinterest to help your start up start up, build your personal brand or drive more traffic to your website. Previous postFire your SEO guy. Here’s 9 reasons why social search is the new SEO. Next postWhat’s in a name? Everything! 10 reasons why naming strategy is crucial for your brand.